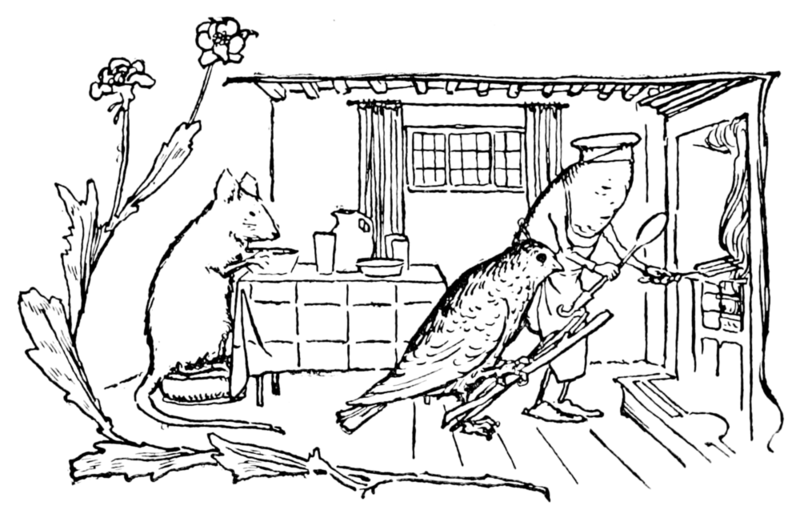 Once upon a time a mouse, a bird, and a sausage became companions, kept house together, lived well and happily with each other, and wonderfully increased their possessions. The bird’s work was to fly every day into the forest and bring back wood. The mouse had to carry water, light the fire, and lay the table, but the sausage had to cook. He who is too well off is always longing for something new. One day, therefore, the bird met with another bird, on the way, to whom it related its excellent circumstances and boasted of them. The other bird, however, called it a poor simpleton for its hard work, but said that the two at home had good times. For when the mouse had made her fire and carried her water, she went into her little room to rest until they called her to lay the cloth. The sausage stayed by the pot, saw that the food was cooking well, and, when it was nearly time for dinner, it rolled itself once or twice through the broth or vegetables and then they were buttered, salted, and ready. When the bird came home and laid his burden down, they sat down to dinner, and after they had had their meal, they slept their fill till next morning, and that was a splendid life.